scribblings on psychology and sustainability. How to Choose a Psychologist in Ecuador. Lithium and A Manic Episode on the Radio. ferguskane on How Universities Work: Deciding Executive Pay. Jon Harman on How Universities Work: Deciding Executive Pay. I have worked in Ecuador as a psychologist for about three years now, both as a therapist and, for a time, as a teacher at Universidad de San Fransisco, Quito. Over that time, I’ve heard numerous tales of bad practice, running the gamut from fraudulent psychologists, inappropriate relationships with patients, through to serious breaches of confidentiality. As a result, I felt it was important to write a guide to finding a good enough psychologist. It’s not a guarantee of finding a perfect therapist, but hopefully, it will help avoid the very worst! There are many different things to consider when choosing and sticking with a psychologist. To some extent, this will depend on what you need from them and whether their skill set matches with that. I’ll deal with that briefly and then move onto some more basic issues – like whether your psychologist has any real training, whether they are running to Ecuador because they lost their license in their own country, whether they use an evidence-based approach and whether they can do the basics like talk about and maintain confidentiality! I’ll start with some commonly recommended questions you might want to consider asking, and then I’ll move onto discussing the issues in more detail. I’ve adapted these questions from the American Psychological Association (APA) and added some of my own. How many years have you been practising psychology? What is your approach to confidentiality? Do you currently have your own supervision? If not, why not? I have been feeling (anxious, tense, depressed, etc.) and I’m having problems (with my job, my marriage, eating, sleeping, etc.). What experience do you have helping people with these types of problems? What are your areas of expertise — for example, working with children and families? What kinds of treatments do you use, and have they been proven effective in dealing with my kind of problem or issue? Do you have a sliding-scale fee policy? Is your psychologist a good match? Besides the basic ethical and competence issues discussed below, the most important thing in therapy is that you and your psychologist are a good match, both in terms of the difficulties you face and in terms of the ‘therapeutic relationship’. Whenever possible, your psychologist should have experience in working with the kind of difficulties that you are facing; if they don’t you may still be able to work together, but in this case, it is important that the psychologist has regular access to high-quality supervision with someone who does. It’s also important that the type of therapy matches the issue you face. For instance, a number of therapies have been shown to have good outcomes when working with trauma (CBT, EMDR and Narrative Exposure Therapy included) and it’s generally best to stick to these proven treatments. Likewise, it’s generally acknowledged that the quality of the therapeutic relationship is extremely important. In a good therapeutic relationship, you can expect to experience what Carl Rodger’s described as ‘unconditional positive regard‘, to feel like you are being listened to and understood, and that you can be open with your psychologist without fear of judgement (for many people, this can take some time even with a great therapist). Therapy should also feel like a collaborative process. Conversely, it’s essential that you don’t feel bullied, pushed way beyond your limits, told what to do, or like the therapist is imposing their own beliefs on you (to pick just a few issues). It’s also worth noting that not every psychologist will be able to work effectively with every client. Some people may have preferences for the gender of their psychologist, while for others there may just be something in the relationship that does not quite work. Even if a psychologist comes with great reviews, but you just don’t seem to be able to mesh, please don’t assume that therapy won’t work for you. A great psychologist will be able to listen to you when you say therapy is not working and either suggest a new approach or refer you to another psychologist. That covered briefly, let’s move onto the issues that I think may be particularly important here in Ecuador. Now for a bit more detail, let’s start with licensing. One of the most serious problems with psychology in Ecuador is that there is NO licensing system here. It is quite simply not possible to lose your license, because it’s not possible to get one in the first place. To be clear, a license is not a degree, but part of a post-qualification system that is designed to make sure that only qualified, competent and ethical psychologists may practice. Importantly, a degree cannot normally be rescinded, whereas a license can be rescinded at any time following a complaint and investigation. In many other countries, such as the UK and USA, you are always able to check whether your clinical psychologist had their license challenged due to malpractice. It’s not possible to check the status of an Ecuadorian psychologist’s license unless they trained or worked abroad. It is, however, possible to check the previous status of foreign-trained psychologists. For instance, a clinical psychologist working in the UK has to be registered with an organisation called the HCPC. Although I let my registration lapse when I left the UK, as it no longer seemed relevant, you can still look me up here, via my surname. In addition, you can also google my name and phrases like “UK lost license” “ethics” etc. I’m aware of people who have found out a lot more about their psychologist using this latter method and I thus recommend it for anyone looking for a psychologist. For US-based psychologists, in particular, there is a lot of information available from state psychology boards. For Ecuadorian psychologists, although there is no license system, it might be worth checking what Google knows about them! If you can’t check for a license, what can you check for? Qualifications. 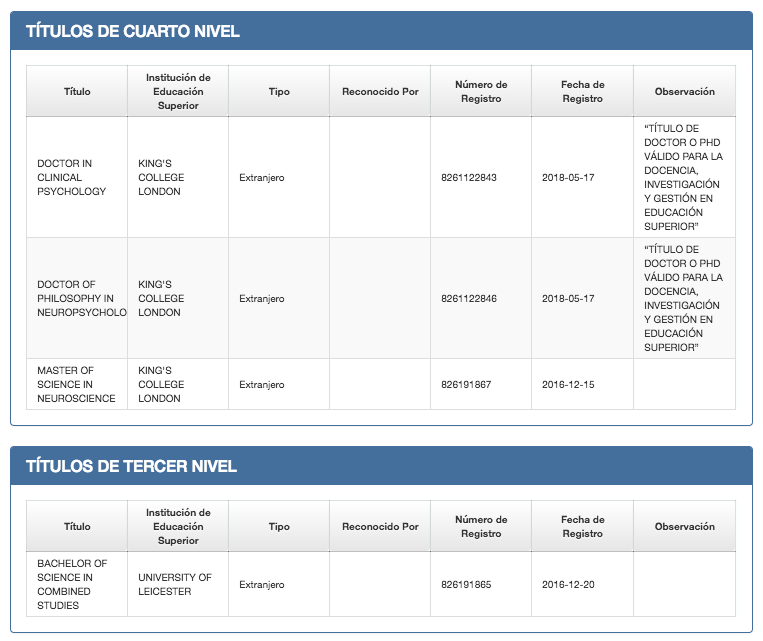 Ecuador has a system for registering your degrees run by SENESCYT. With a person’s ID, you can check here which degrees they have registered with SENESCYT (this applies to all professionals, so you can also check out your architect etc). If you do this, you’ll see a list of the degrees that have been registered (click on the image to see an example from my record). It is also possible to check details with a person’s name, but for foreigners this has to be done on a separate page/tab, which has slightly less information. If you want, give it a go with my name. Now I do not wish to suggest that just because a psychologist has not yet managed to register their degrees in Ecuador, that they can’t be trusted. In my case, it took quite some time to register all my degrees, because of some random bureaucratic obstacles when registering doctorates. Regardless of the status of a psychologist’s registration with SENESCYT, please ask about your potential psychologist’s qualifications and experience. Even if not registered yet, they should also be able to show you their certificates and consent for you to contact their place of training if you so wish. How much training and experience should a therapist have? Experience. There is no easy answer to this question. Generally one would assume that the more experience the better; however the evidence is, as usual, more complex than that. For instance, it has been found that there may even be a negative long-term effect with the most experienced therapists being slightly less effective, perhaps related to a common finding that sticking closely to the protocol (therapeutic integrity) rather than going ‘off piste’ may be related to better outcomes. A newly trained psychologist with supervision may be far better than a more experienced, unsupervised, burned out and cynical psychologist! Whatever the case, it’s likely that the majority of variation in therapist effectiveness is due to other factors than simply years of experience, which brings us to training and evidence-based practice. Training. In the UK, to call oneself a ‘clinical psychologist’ requires at least a first degree of three years and a three-year doctoral degree (DClinPsych) from an appropriate university. In practice, many therapists qualify with significantly more experience than that, often at least a Master’s degree and sometimes a PhD. In Ecuador by contrast, the term ‘clinical psychologist’ does not appear to be protected and so anyone can call themselves a psychologist or clinical psychologist. In practice, some ‘psychologists’ have only a 3-5 year degree (often with rather little actual psychology) while others simply have no related qualifications. I highly recommend, where possible, looking for a psychologist who has at least a Master’s qualification from a foreign university (there is no Master’s degree in clinical psychology in Ecuador). In particular, watch out for ‘internet’ or ‘mail order’ degrees, they are often not worth the paper they are written on. None of this is to say that a newly qualified ‘psychologist’ in Ecuador with just a first degree can’t be helpful, but please do be aware that it’s a level of training that would be unacceptable in many other countries. I practice CBT (Cognitive Behavioural Therapy) and ACT (Acceptance and Commitment Therapy), both evidence-based therapies. What does this mean? A full discussion would be too much for here, but essentially, at the very least, nowadays it means the therapy has been tested to see if it is more effective than a placebo. It also means that the basic assumptions of the therapy will have been tested to make sure they are correct. Evidence-based therapies are also constantly re-evaluated and improved, and the results of studies are published in peer review journals. In Ecuador, one can find a wide number of therapies, many of which come under the term ‘esoteric’. These include things like ‘family constellations‘ therapy. While these therapies may come with great reviews from some of their participants, they have generally not been scientifically tested and moreover may be actually dangerous. Beyond that, they are often allegedly based on untested or untestable concepts like ‘morphic resonance‘ and rely on guru like figures. Worryingly, just in Ecuador, I’ve heard multiple reports of people being left feeling traumatised following family constellations work, and being blamed for the failure of the therapy to work. It is one thing to know how to get a person to revisit a trauma, and another to be able to safely guide them through a therapeutic process. I do not mean to rule out complementary techniques. Indeed I fully encourage trying meditation (which I also teach/practice), having a massage, attending support groups, exercising, horse riding, spending time in nature and such like – all these may be important components of recovery and living a good life. However, I advise being cautious in taking serious issues to poorly trained practitioners selling untested or miracle therapies. For instance, many practitioners will have little or no training in working with suicidal thoughts, flashbacks, trauma, the disclosure of abuse and so on… all of which are key parts of good training for clinical psychologists. This is the most basic cornerstone of psychological therapy, yet based on what I’ve been told, it something that seems to be ignored by a lot of ‘psychologists’ working in Ecuador. My personal belief and training is that confidentiality should be clearly and openly discussed the first time that you meet with your therapist – and it should be the therapist who brings it up, ideally before anything else. 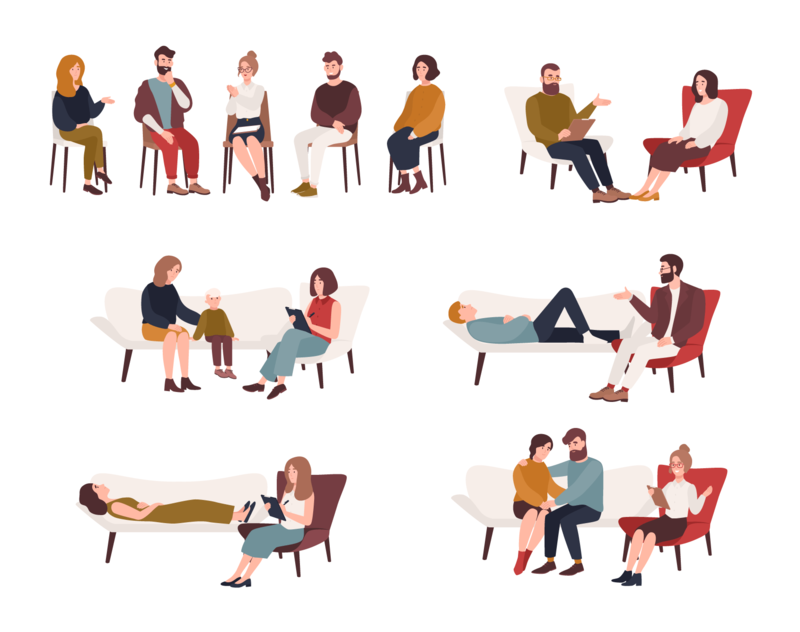 With specific exceptions, a therapist should never discuss identifiable details of your therapy with anyone else without your specific permission. It is NOT ok (without your consent) for your therapist to tell their family and friends about your therapy, it is not ok for a therapist to let others know you are in therapy, and it is not ok for them to discuss your therapy with your family or friends. In other countries, a therapist could lose their license for such lapses. I have heard far too many examples of broken confidentiality. Again, it’s not ok. There are exceptions to the above rule, and these should also be discussed in therapy. For example, a therapist may have to break confidentiality in the case that they are concerned for your safety or that of others. Equally when conducting therapy with children, confidentially is important, but there are times when a therapist will need to disclose information to the client’s parents – generally this should be done with the child’s knowledge. It is my belief that any good therapist should be consistently questioning and updating their own practice. Part of this includes continuing to attend conferences and training though-out one’s career. Another part of this, which I consider essential, means being part of a system of supervision. Supervision allows a psychologist to talk to another psychologist about their clients and to explore any doubts about the approach they are using. Good supervision regularly provides useful insights into what a therapist might be missing and helps improve the therapy that our client’s receive. Please ask your psychologist about their supervision practice. Defensiveness and your right to ask questions! It’s natural to get a little defensive when asked questioned about one’s abilities, training and practice – and that’s as true for psychologists as for anyone. However, a psychologist should be able to recognise this in themselves and deal with it. They should also recognise that it’s entirely for reasonable and indeed sensible for a client to ask certain questions about their psychologist’s professional training and approach. If your psychologist is not willing to answer such questions, that could be a warning sign. It may point to poor training, or it may even indicate that the psychologist is hiding something. Professional vs Personal Questions. Having said that, most psychologists do set boundaries between themselves and their clients, for good therapeutic reasons. That means that they may be cautious in disclosing personal information about themselves. Each therapist has their own boundaries. My take on this is that while a therapist should be open to professional questions, they have every right to gently refuse to answer personal questions. I do sometimes share information from my personal life when I think it might be therapeutically useful, but I also maintain certain boundaries. Signs you’ve already got a dodgy therapist. I may still write something on this, but Joseph Rauch’s 25 Signs of a Bad Therapist: You Deserve Better is pretty good! I hope that this is useful to some of you who might be looking for therapy. As always I welcome comments and suggestions. Next up hopefully… making the most of your therapy.